When I was describing those things that were used by shamans, we are reminded by our elders that that kind of life has passed.... The traditional lifestyle before Christianity is gone. And so are the powers associated with that. Because today our people have accepted a new faith and live a different lifestyle, which does not require the old way of life in order to be successful. The Iñupiaq shaman (aŋatkuq) was powerful and respected, even sometimes feared. Both men and women could become shamans and were called upon by their communities to heal the sick, find the lost, bring game to hunters, control the weather, and forecast the future. They were said to be assisted by supernatural animals, birds, and deceased people, called tuunġat. 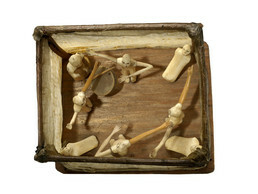 This model of a shaman’s ceremony includes a drummer (possibly the shaman himself), several dancers, and spectators.